Just a quick report on the Shad Run—we have been fishing near the pumping station at Susquehanna State park each evening this week to enjoy the incredible shad run that is at its peak. Each of us caught at least two dozen fish last night using small weighted streamer patterns in chartreuse and yellow. Fish were often caught on the swing through deep pools. Thanks for the shad flies! They did the trick yesterday up on the Gunpowder above Rte 40. The fish seemed to like the red/pink ones and also some yellow flies I had in my box. There were still plenty of fish heading up the river to spawn. I hope it lasts a little longer so that I can get out again. This entry was posted in fishing report on April 30, 2007 by Theaux Le Gardeur. Afte two to four inches of rain locally the Gunpowder River is dropping from a high of 641 CFs on Friday, the 27th, to a much more manageable 356 Cfs today. By mid-afternoon the river will be dropping just below 300 CFS, and by Sunday the river should be in the low 200’s-as long as we don’t get any more rain this evening. When the river is falling, large wild brown trout start eating their bretheren, so try small, sparsely dressed streamers along log jams and cut banks. The river is clear above Masemore Rd., so soft hackles in the #10-12 range and large bead head nymphs should work fine in riffles. Hendricksons have been present in the evening, followed by concentrated spinner falls towards dark. During the spinner fall, dun and spinner imitations that are tied with egg sacks will be more effective than standard patterns. Remember that Caddis are just around the corner, so try a few small elk hair or traditional soft hackles this week between hatches. This entry was posted in fishing report on April 28, 2007 by Theaux Le Gardeur. Please join us for a fly fishing school. On Sunday, June 17, a Gunpowder River guide will be teaching a fly fishing school that is ideal for beginners. The school covers knots, casting, gear and fly selection.Cost is $100 per person and includes the use of gear. Class size is limited to 4 and pre-registration is required. Please give us a call at 410-329-6821 or drop us a line at info@backwaterangler.com to pre-register. This entry was posted in events, news on April 27, 2007 by Theaux Le Gardeur. Why wait to go fly fishing in Maryland? The Gunpowder river is full of wild fish and as this video short from Jason du Pont shows, has prolific Hendrickson hatches early in the season. A close up look at a complete hendrickson hatch from emergence to spinner fall. This entry was posted in video on April 26, 2007 by Theaux Le Gardeur. Please join us for a fly fishing school. On Sunday, June 3, a Gunpowder River Guide will be teaching a fly fishing school that is ideal for beginners. The school covers knots, casting, gear and fly selection.Cost is $100 per person and includes the use of gear. Class size is limited to 4 and pre-registration is required. Please give us a call at 410-329-6821 or drop us a line at info@backwaterangler.com to pre-register. This entry was posted in events, news on April 25, 2007 by Theaux Le Gardeur. Please join us for a fly fishing school. On Sunday, May 20, a Gunpowder River guide will be teaching a fly fishing school that is ideal for beginners. The school covers knots, casting, gear and fly selection.Cost is $100 per person and includes the use of gear. Class size is limited to 4 and pre-registration is required. Please give us a call at 410-329-6821 or drop us a line at info@backwaterangler.com to pre-register. This entry was posted in events, news on April 23, 2007 by Theaux Le Gardeur. This meeting is open to the public and is the SGCPC,(Sparks Glencoe Community Planning Council) Spring meeting. County Councilman, T.Bryan McIntire, State Delegate, Wade Kach, Environment Maryland Representative, Jennifer Bevan-Dangle and Baltimore Co. Dept. of Rec and Parks Chief Naturalist, Bob Stanhope are listed as guest speakers. This entry was posted in news on April 23, 2007 by Theaux Le Gardeur. “We had a great work day on the 14th, but were able to complete only 40% of the project. We have scheduled the next and hopefully the last session for Saturday, 9:30 AM April 28 at Masemore on the Gunpowder.We need about 20 able bodied folks to get this done. Please come on out and bring friends”. Want to get involved? Please give Martin Eisman a call at 410-377-0522. This entry was posted in news on April 21, 2007 by Theaux Le Gardeur. Riffles can be very productive during this hatch. We also had a number of anglers in today that thought Blue Quills might be the ticket. Soft hackles and loop winged emergers are a safe bet in the morning and by mid-day consider switching to a Hendrickson in a #14-16. 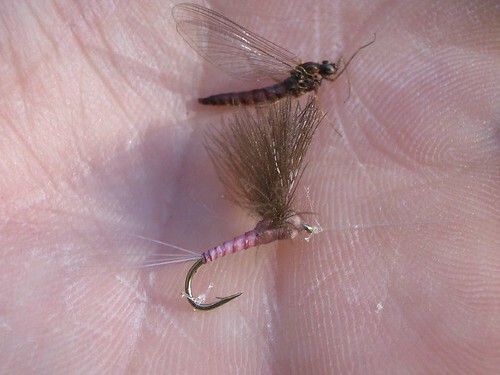 If you see a few larger mayflies in the #10-12 range out there, try a Quill Gordon or March Brown for the heck of it. Historically we have not had as varied a mayfly population on the Gunpowder as compared to streams in South Central Pennsylvania, but we have seen a slight increase in OTF, (Other than Sulphur) patterns on the river since the Maryland Dept. of Natural Resources and the City of Baltimore have been able to manage water temperature and flow to a higher degree in the past few years. 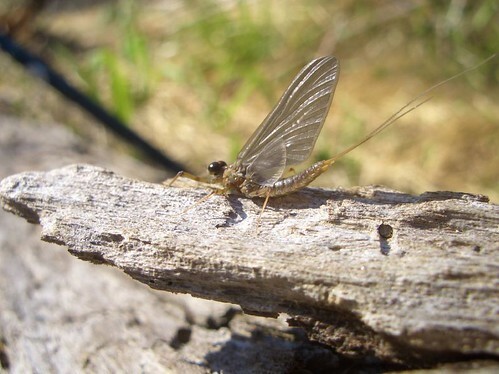 –Plus it’s fun to fish classic mayfly patterns, and it’s about time we all cast to some rising fish. This weekend, the yard will have to wait-go flyfishing on the Gunpowder! This entry was posted in fishing report on April 19, 2007 by Theaux Le Gardeur. Please join us for a fly fishing school. On Sunday, May 13, a Gunpowder River guide will be teaching a fly fishing school that is ideal for beginners. The school covers knots, casting, gear and fly selection.Cost is $100 per person and includes the use of gear. Class size is limited to 4 and pre-registration is required. Please give us a call at 410-329-6821 or drop us a line at info@backwaterangler.com to pre-register. This entry was posted in events, news on April 19, 2007 by Theaux Le Gardeur.